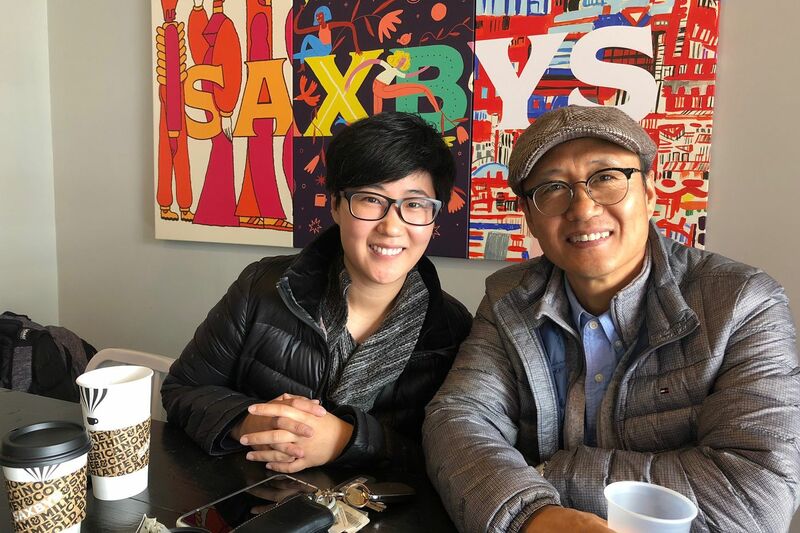 Jennifer and John Choi of Crunchik'n, coming to 212 S. 11th St., on a stop for coffee at the Saxbys shop just up the block. New year, new restaurants. As we start 2019, I run down a few dozen of the projects now in the works. Also this week, I share one of my favorite pizzerias in the area and revisit a classic South Philadelphia bar that happens to be a popular destination among vegans and vegetarians. If you need food news, click here and follow me on Twitter and Instagram. Email tips, suggestions, and questions here. If someone forwarded you this newsletter and you like what you’re reading, sign up here to get it free every week. The restaurant boom continues, it's safe to say, and the Philly region should see at least four dozen newcomers this year. There may be fewer openings this year and maybe a few more closings than last year, but overall I see further growth. On the radar for mid-2019 is a branch of Jean-Georges from chef Jean-Georges Vongerichten, overlooking Center City from the Four Seasons on the 59th floor of the Comcast Technology Center, with a lounge one floor above. Greg Vernick is the chef behind Vernick Fish on the ground floor. Michael Schulson has a 40-seat steak house called Alpen Rose opening soon next to Double Knot on 13th Street near Sansom. There’s The Post, a beer hall in University City packed with arcade games about to open. Crunchik’n, the poultry palace from Ocean City, N.J., is setting up at 212 S. 11th St. this month. The fire-ravaged Bridget Foy’s at Second and South and The Little Lion at Third and Chestnut are being rebuilt for fall openings. And there will three dining options at the new Fashion District Philadelphia (the old Gallery). I have the rundown here. Stay tuned. Chefs Jasper Alivia and Jesus Garcia and manager Alejandro Fuentes are behind this Mexican bar-restaurant, in a soft-opening phase at 2636 E. Ann St. Ownership squabbles sank this popular pizzeria, which closed Dec. 29. Olivier de Saint Martin’s French bistro closed New Year’s Day after 15 years at 246 S. 11th St. He still owns the nearby Caribou Cafe. Unicorn hot chocolate at Kawaii Kitty Cafe, 759 S. Fourth St.
Kawaii Kitty Cafe, 759 S. Fourth St. There's all kinds of sweetness at this Queen Village storefront for young and old. First, there's the pink-hued front room, where for $11 an hour customers can reserve one-on-one time with adoptable cats from the Philadelphia Animal Welfare Society that frolic on the furniture. It's a fun outing for kids ages 5 and older. Then there's the cafe in back, walled off from the cat room and available for walk-ins, that serves all kinds of coffee, tea, cold beverages, and sweet stuff such as lattes with cat faces drawn on the foam and a particularly artistic unicorn hot chocolate ($7.25) with a sugar-rush-inducing topping of sprinkles, marshmallows, and whipped cream. Open Tuesday to Sunday, typically from 11 a.m. Chestnut Hill Brewing Co., Market at the Fareway, 8221 Germantown Ave.
Pizza and beer, that time-tested combo, gets a fresh take at the hands of Nick Gunderson and wife Lindsey Pete at the Market at the Fareway, a collection of food stands in the old Chestnut Hill Farmer's Market. They in fact have three stands: a counter with a big-bellied wood-fired brick oven for 11 varieties of 12-inch Neapolitan pizza, a microbrewery across the aisle turning out eight varieties of beer, and an ordering counter next to the communal seating area. A Shake It Out chocolate stout or a Motra (a West Coast IPA), each $6.50, are just right with one of my favorite pizzas in the region: the Trenton Napoli ($11), a cheese-on-the-bottom round pie with mozzarella, Parmesan, red sauce, and just enough garlic. Such upside-down pizzas are usually found at the conventional deck-oven pizzerias that don't bother with Neapolitan pies. Open Wednesday to Sunday from 11:30 a.m.
South Philadelphia Tap Room, 1509 Mifflin St.
Fourteen interesting beers on tap, plus five dozen in bottles. John Longacre's cheery-vibed classic corner bar, which just marked its 15th anniversary in South Philly, goes one better: the kitchen spikes the tomato soup with Yuengling lager for a grown-up taste. The grilled-cheese sandwich it's paired with ($11) is stuffed with a creamy combo of sharp provolone, local smoked Cheddar, and American cheeses. You can get oysters at the bar, a righteous lamb picadillo empanada, mussels, wings, and even wild boar tacos, but the menu happens to be a dream for vegans and vegetarians, from the "veggplant parm" sandwich and vegan mac and cheese to the fried PB&J for dessert. And while I generally scoff at kitchens that choose to make their own ketchup when Heinz is superior, SPTR's version is solid — which means you also must order the fries. Is this South Philly distilled into a single bar? Grumpy's Tavern has one of the first liquor licenses ever issued in Philadelphia and, owner Joe DeSimone claims, the last-ever smoking variance. 2018 was a year of stellar dining in Philadelphia, and critic Craig LaBan believes some stars deserve a curtain call. Check out his awards, including restaurant and chef of the year. Craig LaBan’s Q&A does not appear this week.